Does your skin feel tight when you finish your facial cleansing routine? Do the usual treatments leave your face dry? The formula of the specific towelettes for very dry skins incorporates creamy moisturizing milk: cleansing and nutrition. In just one gesture they provide complete facial hygiene. It is enriched with creamy moisturizing milk. Nourishing, calming and regenerating effect. 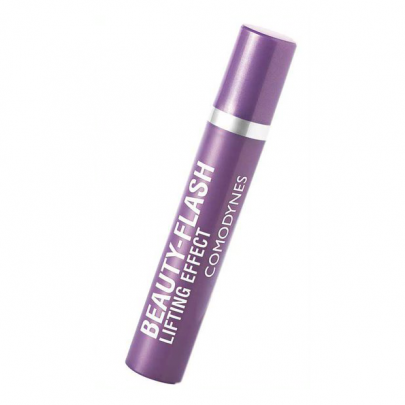 They are equivalent to the use of cleansing milk, facial tonic and eye make-up remover. Formula suitable for face and eyes. Highly recommended for mature skins. MAKE-UP REMOVER EXTRA DRY SKIN are towelettes enriched with creamy moisturizing milk. A single dose replaces the action of cleansing milk, facial tonic and eye makeup remover. Efecto 3 en 1 para una limpieza e hidratación completa en un gesto. The towelettes are made with 100% viscose and moistened with a liquid make-up remover emulsion containing mild cleansing emollients and active moisturizing, regenerating, softening and calming properties. Gently massage onto face and eyes to remove dirt particles and make-up. In less than 1 minute skin is left clean, soft and moisturized. No need to rinse.Fresh finish with no stickiness. 1 minute to a complete application No rinsing required. Paraben-free. Fragrance allergen-free. Recommended for very dry skin. 100% natural and biodegradable fibres. Dermatologically, clinically and microbiologically tested. Polysaccharide from a yeast (Saccharomyces cerevisiae) that increases the activity of macrophages and Langerhans cells, which are the skin’s first line of immune defence against infection. Strengthens the skin’s immune system. Due to its great richness in Vitamin C, it has a great antioxidant and stimulating power of collagen synthesis, it clarifies and unifies the tone and increases the luminosity. Due to its richness in carbohydrates and alpha-hydroxy acids, it increases water retention in the horny layer and stimulates cell regeneration. It provides the formula with emollient and soothing properties so that even the most sensitive skins are hydrated, softened and comforted. With softening, regenerating and soothing properties that reduce the redness of reactive skins, contributing to their comfort and well-being. Increases water retention in the stratum corneum, leaving the skin soft and hydrated. Do you remove make-up before going to the gym? Are you expected to spend many hours on a plane? Do you usually paint on your car before going to work? Are you going to spend the night away from home? The single-dose cleaning wipes are perfect for the car, the toiletry bag and the sports bag. Can be carried in your make-up bag, purse, or bag. They are equivalent to the use of an eye make-up remover, cleansing milk and facial tonic. Effectively cleans impurities, specially designed for SENSITIVE SKINS, satisfying the highest tolerability requirements. 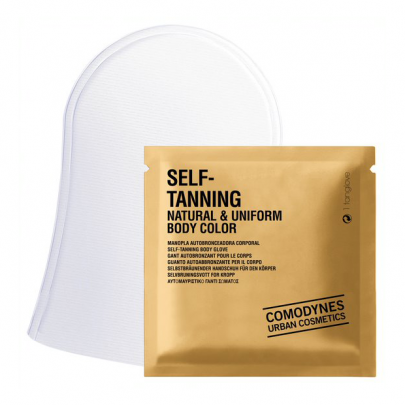 Cleanses and purifies the skin, preserving its hydration and elasticity. Hygiene 3 in 1: cleanses + removes make-up + tones. The first micellar water spray. Easy and comfortable to apply. No rinsing. Specially designed for sensitive skin. Provides 37% hydration in 12 minutes. Purifying wipes for oily skin with acne tendency. If you tend to have oily skin pay special attention to the hygiene of your skin. Make-up Remover Oily & Combination Skin wipes regulate and purify without causing dryness. In less than 1 minute you’ll be done: there’s no excuse! Acne is one of the first problems affecting the skin, good facial hygiene helps prevent the appearance of pimples and combat excess sebum. Purifying Cleanser are the first wipes that remove impurities and purify the skin to prevent the appearance of acne. Take care and say goodbye to acne! Take care and say goodbye to acne! Specific formula for oily or acne skin. Does not dry the skin. Is it difficult to cleanse your face before going to bed? After cleansing do you feel dry and tight skin? Do you usually apply a facial moisturiser after cleanser? This Make-up Remover has been created to provide a complete facial hygiene treatment while moisturizing the skin. Its formula has been specifically created for dry skin. Specific formula for dry skin: cleansing and moisturizing. They are equivalent to the use of cleansing milk and facial tonic. Don’t you ever remember removing make-up? Are you having trouble following your skin cleansing routines? 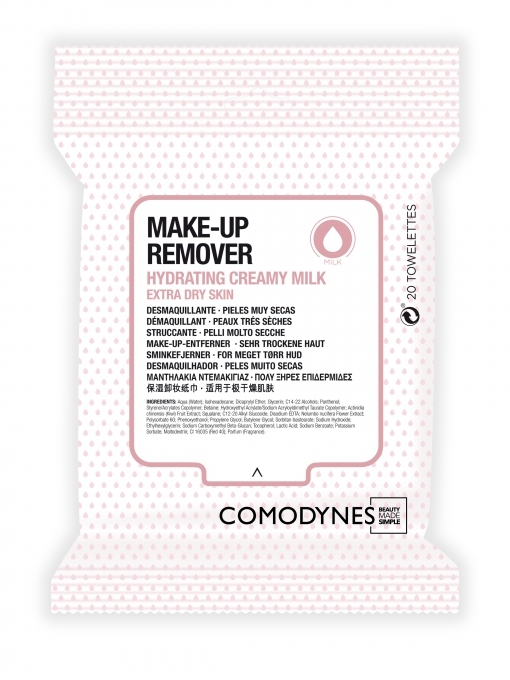 Comodynes make-up remover wipes clean, soften and moisturise the skin in less than 1 minute.